AP DEECET Exam is a Common Entrance Test conducted by Andhra Pradesh District Institutes of Education & Training (DIET). Every year AP DEECET exam provides admission into the full-time course for D.Ed (with duration of 2 years) in DIET. This year also AP DIET announced the notification for Admission in Diploma Elementary Education course (D.Ed) in March 2019. The Last date to apply Online for the Andhra Pradesh DEECET Exam is April 2019. The Government of Andhra Pradesh, School Education Department will publish the AP DEECET Notification 2019. The School Education Department was formed with the aim of nurturing & educating all the students. By providing better access, promoting enrollment and retention to providing equity, quality, and school infrastructure. Andhra Pradesh State has a total of 61,952 Schools covering 13 districts that include Primary Schools, Upper Primary Schools & High Schools. To become a teacher in any one of these schools, the aspirant should possess B.Ed or D.Ed. So this AP DEECET 2019 Notification is a good chance for the contenders to get admission into D.Ed course. Candidates who wish to become a teacher in any one of the government schools in AP may Apply for this AP DEECET 2019 Exam. Candidates can apply for AP DEECET Exam 2019 through online only. Online applications for the AP DIETCET for the year 2019-20 are available on the official website. Aspirants who have completed (10+2) or equivalent degree are eligible to Apply for AP DIETCET Exam 2019. Please read the complete AP DEECET 2019 Exam Notification before applying. 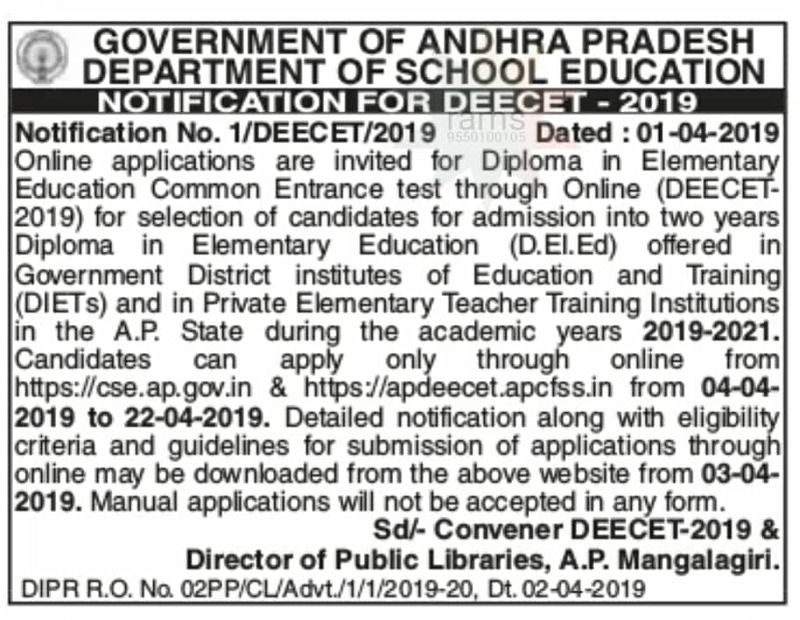 Candidate can download AP DEECET 2019 Notification from our site which will be available below. Remaining details like eligibility criteria, Application Fee, and Application Details are provided below. Interested and Eligible candidates who are waiting for this post may apply online between March 2019 to May 2019. The online application is available for AP DIETCET Exam from this page. AP D.Ed Online Applications are also available at the official website that is deecetap.cgg.gov.in. In this article, we are providing the details regarding AP DEECET Notification and Exam procedure. So, go through the following sections for AP TET Exam 2019 Notification, Important Dates, Eligibility, Application Process, etc. Aspirants who were applying for AP DEECET Exam 2019 should meet the below DIETCET eligibility criteria such as Educational Qualification and Age Limit. The eligibility conditions are given on our website is based on the eligibility criteria as given in AP DEECET Exam 2019 Notification. Aspirants who have passed the Intermediate (10+2) or its equivalent with 50% minimum marks (45% for reserved candidates) are eligible to apply for AP DEECET 2019 Entrance Exam. The candidate who appeared for 2nd year inter examination may also apply for this entrance examination, but need the pass at the time of admission into the course. Candidate should satisfy the age limit as on the given date. Name of the Organization Department of School Education, Government of Andhra Pradesh. Examination Name Diploma in Elementary Education Common Entrance Test (DEECET). The Application fee of Rs. 200/- has to be paid through AP Online Centers or e-Seva centers or Payment Gateway. Check the AP DIETCET 2019 Official Notification for complete details. Andhra Pradesh DEECET 2019 Online Application – How to apply Online for AP DIET? Candidates can get an online application for AP DEECET 2019 Exam at official website deecetap.cgg.gov.in- Fill it carefully through online & submit it on or before the given date. Follow the instructions in Information Bulletin provided in DEECET official website while filling the online application. Aspirants appearing for the AP DEECET 2019 exam should prepare the Standard textbooks from VIII to X. Candidates can take entrance test in Telugu/ English/ Urdu mediums. Candidates can download the AP DIETCET Exam Admit cards from the official website to check their DEECET Exam Date. Admit cards for the AP DEECET exam 2019 will be available at the official website deecetap.cgg.gov.in. Once the Admit Cards release, then the candidates will intimate about that through E.mail or SMS. Then candidates can download their admit cards from the official website. Once the results have been declared, the candidates can check their AP DEECET 2019 Exam results at official website deecetap.cgg.gov.in. Aspirants rank along with their marks in the entrance test will be available in official site. if you have any doubts regarding the DEECET 2019 Exam, you can refer the AP DEECET Official Notification. So that, you can find solutions for all of your doubts. The direct link to download the AP DIETCET Notification 2019 enclosed below. So, need to go to the official website cse.ap.gov.in and search for the official Dietcet Notification.